Because Michigan just beat Illinois and is poised to become the #1 team in college basketball for the first time since 1992, it's time for me to write something pessimistic--or so has become the narrative about this blog. In reality, this is something I have been interested in investigating for a while and finally hunkered down to do the research after some Twitter back-and-forth with Jamie Mac (Just Cover Blog) and Steve Lorenz (24x7). It has to do with Nik Stauskas and his, in my eyes, obvious desire to answer an opponent's made three pointer with a bucket of his own. When watching Stauskas, it always struck me how aggressive he became after the opposition hit a three pointer, often resulting in an irresponsible shot--though occasionally flashing some of that "swag" the kids are so excited by. What I wanted to look at was Stauskas' typical usage rate versus how he responds to an opponent hitting a three pointer. Distilling all of the available data and filtering it properly--what 3-pointers was Stauskas actually on the floor for?--without watching every minute of every game again was difficult, but I found an easy workaround that stands up to a sanity test. For starters, I took into consideration the total amount of three pointers that each opponent has made against Michigan. Finding how Stauskas responds to individual shots meant finding out which ones exactly he was on the court for. MGoVideo has YouTube links to each conference game Michigan has played. Using those and comparing them to the play-by-play data from ESPN, which shows the timestamp of made baskets, I was able to quickly skip through conference play to each opponent three pointer and see whether or not Stauskas was on the floor. Then, I could check the corresponding ESPN play-by-play to see the result of the next play. I knew this would arise before I started. The sample size: it's small. But I also didn't grab this data in a vacuum. There's a reason I didn't look at, say, Trey Burke's tendencies following an opposing made three pointer or how Glenn Robinson III plays following a defensive rebound. Watching Stauskas on the floor following these three pointers, he's noticeably more aggressive. The numbers, I think, despite the small sample size, bear this out. Though Stauskas' shot selection occasionally bothers me, this isn't really a critique of his game. He's a freshman and appears to be a particularly excitable one. 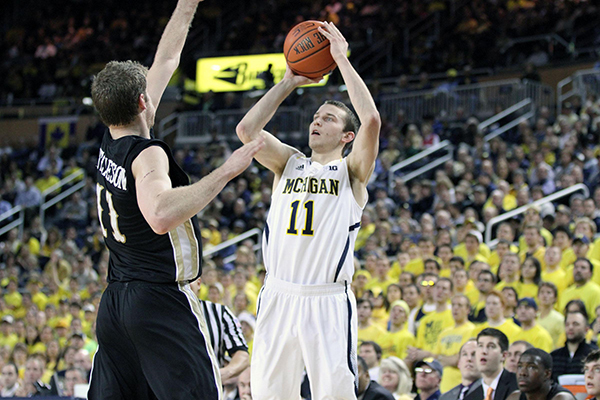 I like that and I think as time goes on, this aggressiveness will turn Stauskas into a legitimate #1 scoring threat. Right now, though, it's the kind of thing that needs to be reeled in. This is the kind of thing I'd like to track throughout the season but will probably forget to. As the sample size grows, however, I may be able to see whether or not there's any veracity to this or if I'm just spouting off again. *Since the Illinois game just ended, I haven't been able to rewatch it to determine exactly how many of their 6 three pointers Stauskas was on the floor for, so I just assumed he was on the floor for all 6, a number that is almost certainly too high. **A sanity check of this number holds. In the conference schedule, we know he was on the court for 35 of 49 made threes. If you apply the same logic (49 * .7575) you get 37.117, or approximately 35. The reason this simulated number is slightly higher than the actual is likely due to late-game catchup scenarios when Stauskas may be on the bench. In blowouts, the likes of which Michigan has had plenty of, teams will start throwing up an inordinate amount of threes while Michigan is resting its starters.